Because landlords retain a duplicate key to enter a unit for repairs or in an emergency, they have a legal duty to protect a tenant from misuse of these spare or master keys. 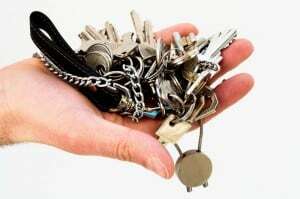 If a landlord’s duplicate key is stolen and the tenant is injured, the landlord may be liable for negligence. 1. Limit the number of duplicate keys. 2. Invest in a locking key box. 3. Use a code system to identify the keys, not apartment numbers or addresses. 4. Keep the code and the keys in two separate, secure places. 5. Keep the room or closet where you keep the keys locked. 7. Always change all of the locks in the unit before a new tenant moves in. 8. Require workers to ‘check out’ the key and record names, times. 9. Conduct background checks on workers.